BioTechniques| Silencing sepsis: could basophils be the key? Silencing sepsis: could basophils be the key? Research into the origins of sepsis has identified a type of rare white blood cell, basophils, as a potentially key component in preventing the development of the condition. 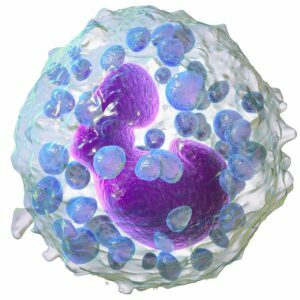 Basophils, a rare subgroup of white blood cells, have been shown to play a key role in the beginning of the immune response to a bacterial infection, and therefore can now be considered an important factor for studies into the prevention of sepsis, the leading cause of infant mortality worldwide. These findings were identified by a research group from Seattle Children’s Research Institute (WA, USA), led by Adrian Piliponsky. Sepsis is the result of an overactive or faulty immune response, typically to a bacterial infection, and despite its prevalence in children and hospitals there is still a lot we do not understand about the condition. In order to explore the origins of sepsis, the research team decided to study the initial stages of the immune system’s response to infection, focusing specifically on basophils. Basophils account for just one in a hundred white blood cells but immunologists have speculated for some time that they can enhance our immune defense against pathogens. Using genetically modified mice the researchers induced a model of infection that mirrored the progression and characteristics of human sepsis. The results showed that basophils were one of the first types of cells to arrive at the sites, enhancing inflammation in the early stages by releasing Tumor Necrosis Factor (TNF) protein, leading to an enhanced survival rate in the mice. TNF is vital to the immune cascade, triggering the activation of other immune cells and leading to the inflammation required to protect and heal damaged or infected tissue. The results of this study, specifically the presence of this protein, lend credence to the theory that a reduction in basophil activity at the initiation of an immune response could be responsible for the development of sepsis. “These findings show that basophils, despite their low numbers, can trigger a cascade of events that both helps them to initiate an immune response against infection and enhances the effectiveness of this response. Together, these findings provide novel insights into how basophils, and basophil-derived TNF, might have key roles in the early stages following bacterial infections and in resisting the progression of such infections to sepsis,” wrote Piliponsky and his co-authors in the paper. This study draws attention to the activity of basophils and basophil-derived TNF regarding the inception of sepsis, highlighting the need for further research into basophil function to help establish potential risk factors or treatments for the immune condition.